You’ve got a shiny new Android tablet in your hands, but is the tablet’s most important app – the web browser – up to snuff? 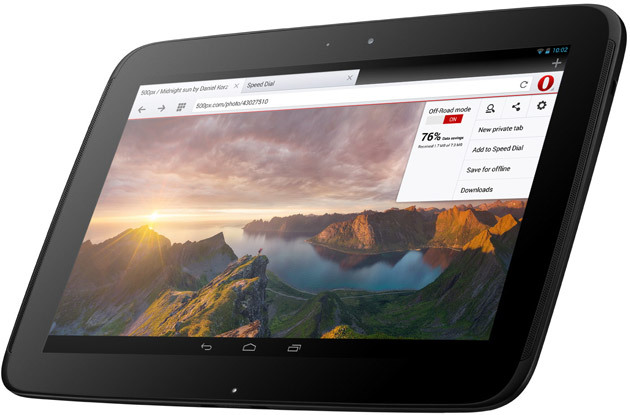 Introducing the Opera 18 browser for Android, bringing a top-notch web experience to your Android tablet. The full-featured Opera for Android browser is the go-to choice for easy access to the world of websites while on tablet. Opera has handcrafted mobile-phone browsers for almost two decades; tablets, however, are a different beast than mobile phones. As well as the obvious difference in size, tablets put you in a different state of mind and offer a more relaxed, lean-back browsing experience. That’s why Opera has given special attention to tablet design during the development process and now debuts its browser for large Android tablets. To come up with the Opera for Android tablet version, engineers at Opera Software followed the design philosophy of not just scaling up the smartphone interface, nor just shrinking a desktop browser down, but instead tailoring all aspects of the user experience to the tablet form factor. “We poured a great deal of thought into the Opera for Android tablet version,” says Johan Schön, SVP for Mobile Consumer Browsers, Opera Software. “The size of devices and mindset of users make the tablet very different from its smaller cousin, the smartphone, and we have to respect that. In Opera 18 for Android, we have spent hours and hours tweaking, and fiddling with the placement of, even the most minute detail, just to get that top tablet feel”. Every detail of the user interface is meticulously planned, thought through and re-thought before implementation. Access to the most used functions, such as back and forward buttons and the menu page is conveniently located where your fingers naturally rest while using a tablet. The Discover feature is a one-stop shop for all your news, sports and interesting feature stories. Swipe from right to left on the Speed Dial start screen to access your personal selection of fresh content from your region. Only interested in cars and cooking? It’s easy to customize the news feed to fit your interests. No extra surfing necessary. The Off-Road mode lets you go online in rough conditions, such as a crowded, free Wi-Fi hotspot in a café, or saves you money while roaming with your data plan. Off-Road mode compresses the data traffic to minimize data usage. Speed Dial, an Opera innovation, makes the perfect companion for any tablet. Large, square buttons allow you easily to add, organize and access your most frequently visited webpages. Opera for Android is part of the Opera browser lineup, which consists of the full-fledged Opera browsers for Windows, Mac and Android, the Opera Mini browser series for practically any mobile phone, and the more minimalistic Coast by Opera browser for iPad. Download Opera 18 for Android to your Android smartphone or tablet from Google Play or m.opera.com today.